Radiation Mucositis is one of the most common side effects or complications resulting from radiation treatment in Head and Neck cancers. It results form Ionizing radiation induced cellular damage in basal epithelial cells of the oropharynx. 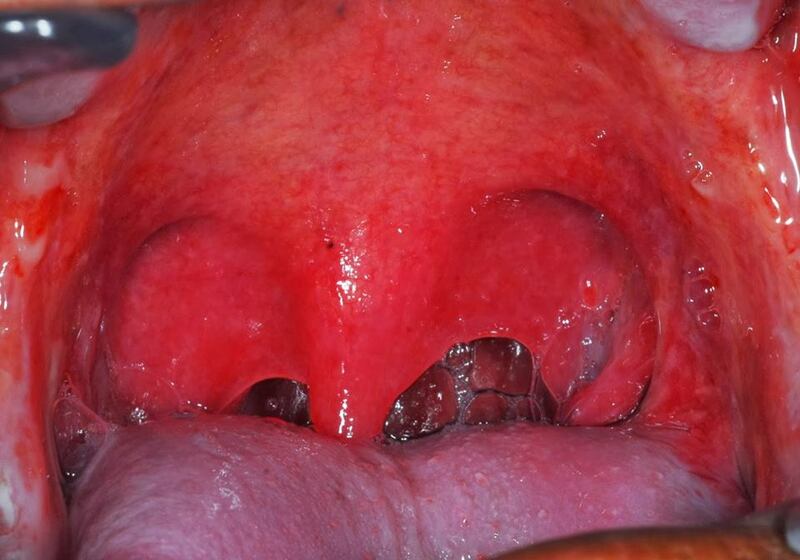 The result is mucosal thinning and ulceration with susceptibility to infection. The condition can be diffusely painful causing malnutrition in affected patients. The effects are pronounced if radiation and chemotherapy are combined. Oral sensitivity is seen even after the radiation treatment is concluded due to mucosal atrophy and neurologic syndromes. Hyposalivation or Dry Mouth is one of the most common symptom seen in radiation therapy which can lead to oral colonization by Candida albicans and can increase with tobacco use and denture use. The lesions in Radiation induced Mucosistis the lesions are limited to the fields of radiation. The lesions are usually seen in radiations doses of approximately 200 cGy/day, mucosal erythema is noted 1 to 2 weeks after the start of therapy and is followed by ulceration in the third or fourth week. The symptoms are seen as long as 2-8 weeks after the cessation of therapy and in case of extended radiation protocols the damage is more to the mucosal tissues and even the submucosal vasculature along with connective tissues are affected. The mucosal lesions appear to progress throughout the course of therapy and heal within 4 to 8 weeks after completion of therapy. Depending on the dose, fraction and duration of radiation the development and severity of radiation mucositis is seen. Mucosal tissue surrounding metal restorations are affected more due to the radiation as the primary bem when comes in contact with the metal restoration or any fixed appliance is scattered called as backscatter radiation which is known to travel short distances. So the tissue surrounding the restorations are exposed to the primary beam and the scattered radiation as well resulting in increased mucosal breakdown. Metal appliances which are removable should be removed and the tissue around the fixed metal restorations are retracted away to decrease the exposure to scattered radiation with the help of vinyl mouth guards or cotton rolls. For Systemic relief – Acetominophen 650-1000mg and ibuprofen 400-600mg three times daily. According to (Head and Neck Cancer by Louis B. Harrison) have shown that a Magic Mouthwash- dilute formula for swish/gargle/expectorate is – Normal Saline, NaHCO3, Benadryl liquid and Viscous Xylocaine 2% should be used by diluting and used as a gargle thrice daily for relief and faster healing. Patients who do not stop smoking after radiation therapy there are high chances of secondary lesions to appear. Patients should be counseled to discontinue tobacco and alcohol.